It's time to wish well the character of Neil Winters in what is sure to be a moving storyline coming to The Young and the Restless. 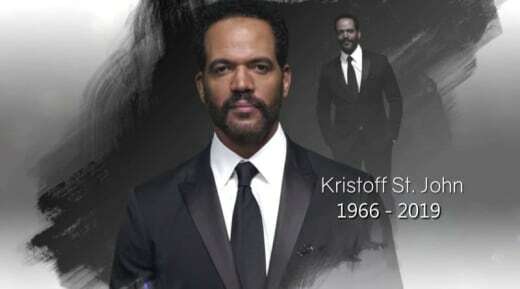 The long-running soap opera will say a very emotional goodbye to Kristoff St. John in a four-episode arc beginning Tuesday, April 23. The final episode of the arc will be on Friday, April 26, culminating with a tribute episode on Monday, April 29. The tribute episode will feature former and current Y&R stars sharing memories of Kristoff and the iconic character of Neil Winters he helped create over 28 years ago. In the special episodes, Genoa City gathers to remember one of their own when Neil Winters passes away unexpectedly. Neil’s family and friends come from near and far to pay their respects and remember their cherished father, colleague, brother, and friend. Neil’s family learns of his passing on Tuesday, April 23 and the story will be featured prominently for the remainder of the week. Shemar Moore (“S.W.A.T.”) reprises his role of Neil’s brother, Malcolm Winters, for two episodes, on April 25 and April 26. Christel Khalil (Lily Ashby) and Eileen Davidson (Ashley Abbott) also return for this storyline. Additionally, actor Stan Shaw, Kristoff’s longtime friend, and co-star from “Roots: The Next Generations,” will appear as the Reverend at Neil’s funeral on April 25. On Monday, April 29, Y&R will air a special tribute episode to Kristoff. The episode will include current and former cast members sharing memories of their dear friend, along with memorable Neil Winters clips spanning his 28 years on the show. Participants include former Y&R cast members Moore, Victoria Rowell, Eileen Davidson, and Mishael Morgan, as well as the current Y&R cast. Also, Kristoff will be remembered in a special segment of The Talk on Friday, April 26. The segment will include an intimate conversation with Moore, Rowell, Christel Khalil, and Bryton James, as well as clips of Kristoff dating back to his early years on Y&R. Created by William J. Bell and Lee Phillip Bell, The Young and the Restless premiered on March 26, 1973. It has been TV’s #1-rated daytime drama for the past 30 years. The series, which is in its 46th season, is broadcast weekdays and is produced by Sony Pictures Television, in association with Bell Dramatic Serial Company. Related: Lauralee Bell Has a New TV Movie, a PSA Message, and Thoughts on Y&R!! Let us know if you'll be tuning in to view the final story arc for Neil Winters and the tribute to St. John. We'll have coverage of the events as they unfold during the week. The Young and the Restless airs weekdays (12:30-1:30 PM, ET/11:30 AM-12:30 PM, PT) on CBS.